Let me tell you, without a doubt, that the flu shot does not give you the flu. This is perhaps one of the most common misconceptions I hear as a physician. People absolutely swear by it. I’ve even had people tell me that family members got the flu shot and then died suddenly. I’m sympathetic, but how misguided! Before we talk more about the flu shot, let me explain why influenza is so dangerous. According to the Centers for Disease Control (CDC), there are between 12,000 to 56,000 deaths and tens of thousands of hospitalizations from influenza each year. Individuals at the extremes of age (i.e., very young or very old), pregnant women, and those with chronic medical problems are at greatest risk. However, this infection can kill healthy people. I see it every year and it’s tragic. Mark my words, once flu season peaks this winter, you will see stories on the national news about otherwise healthy people dying from the flu. It can be really scary. Let’s learn a bit about the flu shot itself. 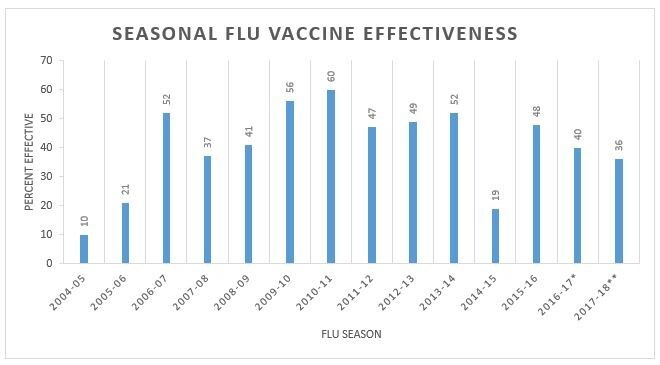 Without getting too technical, each year the vaccine manufacturers collectively make an injection that possesses several inactivated (i.e., dead) pieces of the flu strains that are expected to be most active in the upcoming season. Sometimes this guess misses the mark, other times it’s better. That’s why each year you will hear about the “effectiveness” of the flu vaccine. But it’s always worth getting. As a quick aside, for the 2018-2019 flu season, there is also a nasal spray flu vaccine, but I’m not going to talk about it here. Not only does the flu shot help you individually, it can also protect those around you. For example, infants must be six months old to get the vaccine, so if you’re exposed to a newborn you can indirectly protect them by what’s commonly referred to as “herd immunity.” And remember, an estimated 20% of those infected with the flu can remain asymptomatic. OK, so let’s talk about real side effects of flu shot. You might develop soreness around the injection site, muscle aches, headache or low-grade fever. The reason these side effects occur is because your immune system has been triggered. However, the only side effect I’ve ever experienced has been a sore arm for a couple of days. Not a bad tradeoff in my opinion. In addition, those individuals with severe egg allergy, a history of a neurological disorder called Guillain-Barre Syndrome, or an active infection should generally not get the flu shot. But what about the flu shot myth? For those still convinced the flu shot can (or did) cause the flu, let me finish this post by explaining how this could seem to be the case. Many respiratory viruses cause symptoms similar to influenza, therefore you could actually be infected with something else. Since it takes about two weeks for the vaccine to work, you may have been exposed to the flu before your immune system had a chance to prepare. In any given year, the flu shot is never 100% effective, so you could still get the flu. However, the flu shot did not cause the flu. I know from firsthand experience that many people have strong opinions about the flu shot. If you’re one that always gets your vaccine, please continue to do so. And if you’re one that never does, please at least consider trying it out this year. The flu virus is no laughing matter. Next post > This physician stuck himself with a needle. Intentionally.